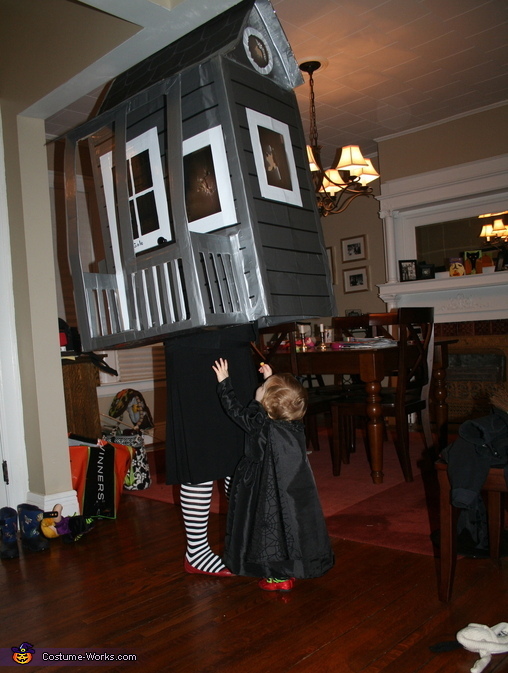 My 15 month old daughter, Mara, is dressed as the Wicked Witch of the East - complete with ruby slippers and a homemade dress and cape. (She wouldn't keep the hat on or hold onto the broom.) I planned on accompanying her as Glinda, but I'm pregnant and getting the dress measurements right was becoming stressful. I decided that if I was going to look like a house, I might as well actually look like a house! Hence the idea of dressing as Dorothy Gale's house was born. As I wanted to make the costume construction pregnancy safe, the house is made entirely of cardboard and duct tape in 3 different colors. If you see this can I please have the instructions?